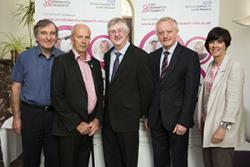 Launching Join Dementia Research were Professor Bob Woods, Chris Roberts, who lives with dementia; Prof Mark Drakeford; Vice-Chancellor Prof John G Hughes and Prof Jo Rycroft-Malone of the School of Healthcare Sciences.A nationwide online and telephone service that helps people to take part in dementia research studies launches in Wales today (2/7/15). Join Dementia Research promises to accelerate the pace of dementia research in Wales by allowing people with and without dementia to register their interest in studies, and helping researchers find the right participants at the right time. Dementia currently affects 850,000 people in the UK and over 45,000 of those are from Wales. The impact of dementia is however far greater, with 25 million of the UK population having a close friend or family member affected. A new national poll* has shown that almost two thirds of the general public (62%) would be willing to take part in dementia research, but more than four out of five people (81%) wouldn’t know how to volunteer. Join Dementia Research is designed to overcome these barriers and give everyone the opportunity to play a role in changing the outlook for people with dementia now and in the future. The lack of access to willing volunteers is holding back critical research into the condition with government figures showing that less than 5% of people with dementia take part in research studies. Join Dementia Research will boost research participation by connecting people interested in research to suitable dementia studies across Wales and other parts of the UK, as well as streamlining the recruitment process for researchers. By signing up, volunteers agree to be contacted to take part in new studies getting underway in their area, from which point they can decide if they wish to take part. Join Dementia Research is a collaboration between the National Institute for Health Research (NIHR), Alzheimer’s Research UK, Alzheimer’s Society and Alzheimer Scotland. Since its launch in England and Scotland in February, over 7500 people have registered their interest in research studies. Of those, more than 1300 have already been enrolled into research. One of the studies recruiting for volunteers in Wales is called AD Genetics, which is looking into how certain genes affect the likelihood of developing Alzheimer’s disease, particularly young-onset. Volunteers who are recruited to the study will be visited by a nurse and asked to complete a short interview and memory test. “After a diagnosis of dementia your whole family also receive the diagnosis, it's a team effort. What we then need is hope; this is what research gives us. That’s why it's so important for people to be aware and to know that research is taking place. As well as the people living with dementia we also need people with healthy brains. Together we can make a difference, please be a part of my team, and join dementia research." Anyone aged 18 years or over can sign up themselves, or on behalf of someone else, either by registering online or by contacting the helplines of Alzheimer Scotland (0808 8-8 3000), Alzheimer’s Research UK (0300 111 5 111) and Alzheimer’s Society (0300 222 1122). By signing up to the service, people give permission for researchers to contact them with details of studies in their area that match their profile. People can then decide if they would like to participate in those studies on a case-by-case basis. By registering, people do not have to take part in any studies and can opt-out at any time.